As a boy, Hank faced many difficulties and shortcomings. He had to face the trauma of his parents' divorce at just eight years old and he was forced to stay with his paternal grandparents, including his abusive grandmother who forbid him to see his mother. He regularly snuck out at night and walked the railroad tracks to Liverpool where his mother was living and working. Not willing to return to his grandmother, who would often beat him for visiting his mom, he would sometimes seek shelter in Liverpool's railway station, now home of the Hank Snow Home Town Museum. He would go on to become a pioneer in country music, releasing over 120 records, writing almost 800 songs, selling over 80 million records worldwide, and being signed to the longest recording contract in history. 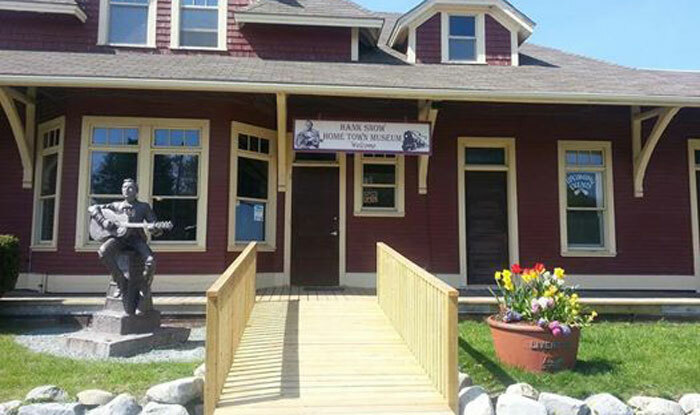 Come visit us we are located on Nova Scotia's beautiful Lighthouse Route, just 1 minute off Hwy. 103, exit 19, in Liverpool. Check out the Annual Hank Snow Tribute mark it on your calendar!